Frontier Airlines is adding a fee for carry-on bags, and plans to start charging $2 for soda and coffee. The new carry-on fee announced Wednesday will be $25 if paid in advance, and $100 if paid at the gate. It applies to bags in the overhead bin, so small bags under the seat will still be free. Passengers who buy their tickets on the airline&apos;s website won&apos;t have to pay. 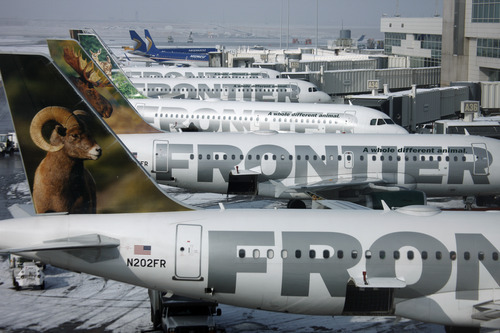 Frontier says the new fee will take effect this summer, and it will announce a specific date later. The new drink fee begins July 1. Water will still be free. Spirit Airlines Inc. began charging a carry-on fee three years ago. Frontier&apos;s parent, Republic Airways Holdings Inc., is trying to fix Frontier&apos;s finances and sell it.